"Remember a Crab is Just a Crab 'til you cover it with J.O." J.O. Spice trucks deliver a full range of products, not limited to seasonings, to your local restaurants, crab houses, seafood markets, grocery stores including gift shops, tackle shops, local butchers & processors, and more. Our delivery area consists of areas as far North as Philadelphia, Pa., as far South as the Quantico Marine Corps Base in Virginia, as far East as Ocean City, Maryland and the Delaware Beaches, and as far West as Hagerstown, Md. Please call us if your business is outside of our delivery area. We will be happy to refer you to one of our distributors or we can ship directly to your business by your preferred method of shipping. We encourage you to look at our online store (serves as our colored catalog) to see everything we have to offer. Wholesale pricing will be quoted once determined if your company meets the criteria to qualify as a wholesale account. J.O. Spice Company, Inc. specializes in custom blends and packaging for all of your industry needs not limited to Seafood Seasonings. Confidentiality forms are signed by both parties before the process begins ensuring your recipe remains between both parties at all times. Please contact us to begin your process or let us answer any questions you may have. Our friendly staff is here to help. J.O. No. 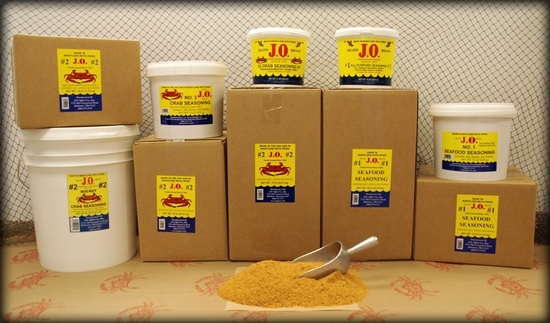 2 "Crab House Spice" - A ready mix which is a custom blend of spices and salt which adheres to the crab. This blend allows for uniform portions to be applied to crabs. It saves time and you get it right every time. A true Chesapeake Bay flavor. Add after you boil or before you steam. For use on Blue, Dungeness, King and Opilio Crabs. Now you can provide J.O. 's most popular seafood seasonings. J.O. No.1 Seafood Seasoning and J.O. No. 2 Crab Seasoning, in an easy to open, reusable tub. J.O. 's 5lb & 10lb tubs are recloseable, reusable and easy to store. The tamper evident, white container is moisture resistant and blocks the discoloring effects of UV light. For each dozen crabs use one cup water and one cup vinegar, which should be put in container first. Then place crabs on elevated platform in container and sprinkle J.O. Seasoning generously over each layer of crabs. Steam about 20 to 30 minutes until bright red. Other services available to Restaurants and Distributors include custom blending of seasonings, portion control spices, customized wooden crab mallets and private labeling of any of our products. Please call or visit our Contact Us page for additional information.